Last weekend I made a social visit to the Twin Cities. A good friend mentioned that the nice part about Midwestern single-digit temperatures is that it gives me time off from working on the boat. If only that were true. The cold merely slows things down; the main thing it slows down is me. I run out to my unheated garage to make a couple of quick cuts on the table saw, then maybe get set up for running the router before I get too cold. I don’t mind setting things up when I am cold, but I like my hands to be nice and warm when I am running power tools. 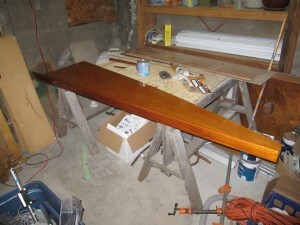 Winter does prevent things like epoxy, caulk, paint and varnish from setting up. However, you can get some amazing things done with a portable heater. 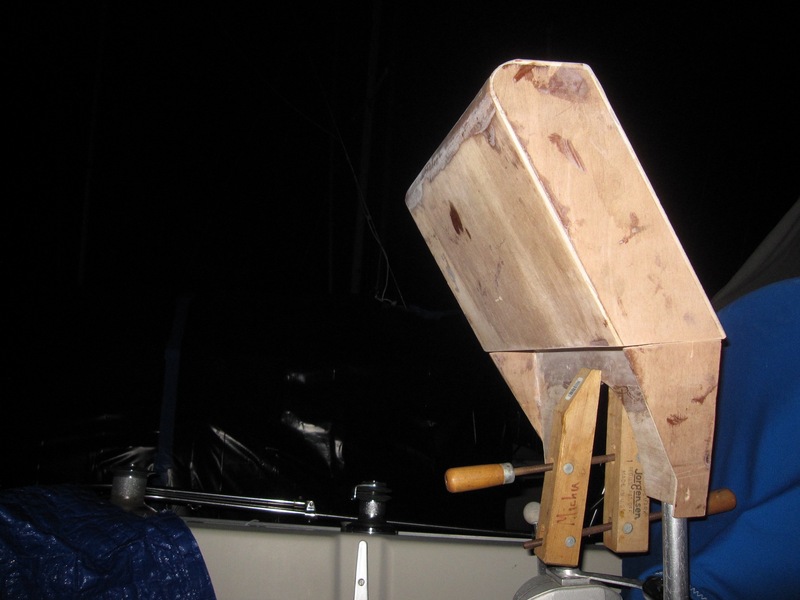 Other projects will have to wait until we have overnight lows in the 40’s–although I can have them all set up to go, so that when the temperature is right: *Boom* three new through-hulls caulked into place. 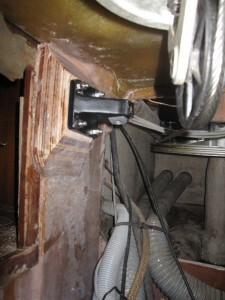 While it is true that I work less on the boat, I can still do a lot of boat work, primarily in the basement. I fabricated this board in the basement. I made it to stiffen up the bulkhead, and added a fancy stand-off to correctly locate the fixed end of the steering ram. There can be a lot of force transmitted from the rudder to the steering ram. If one end of the ram tears off the wall, it is not good. 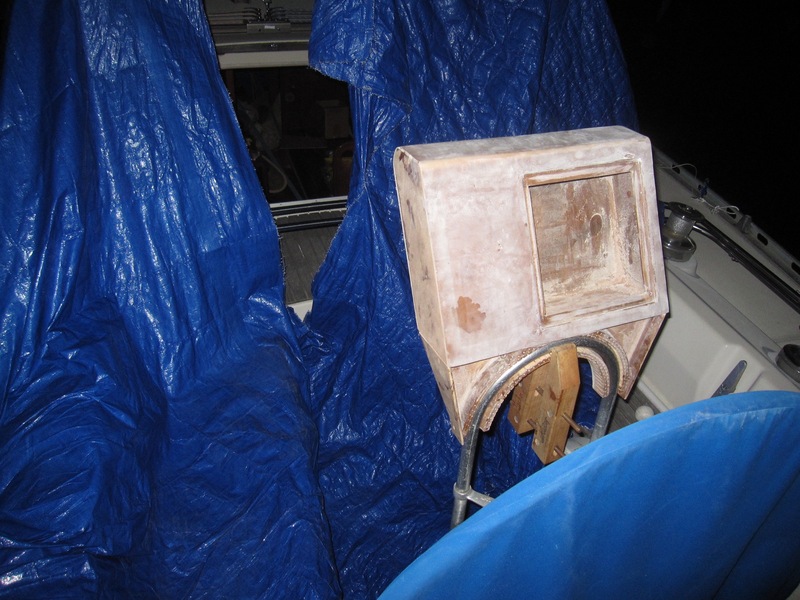 I brought a little portable heater to the boat to heat up the engine compartment, the epoxy and the board. 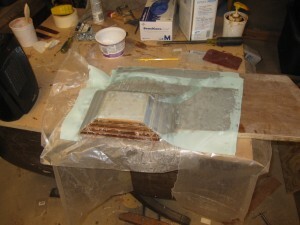 Once it was all good and warm, I epoxied the whole thing to the existing bulkhead and tabbed it in place. 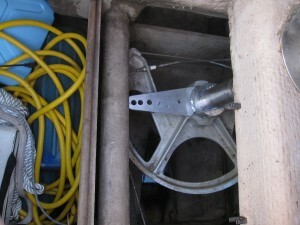 The autopilot tiller arm bolted directly on to the rudder post. It turns out you can still drill holes and tighten bolts in weather well below zero. Next trip to the boat: mount the autopilot computer and heading sensor; mount the new steering stop; maybe do some wiring (if I have the time and am not too frozen). Milou is a little lacking when it comes to easy-access storage. 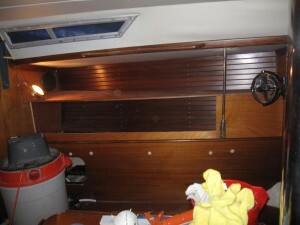 I am converting the port pilot berth in the saloon to storage. 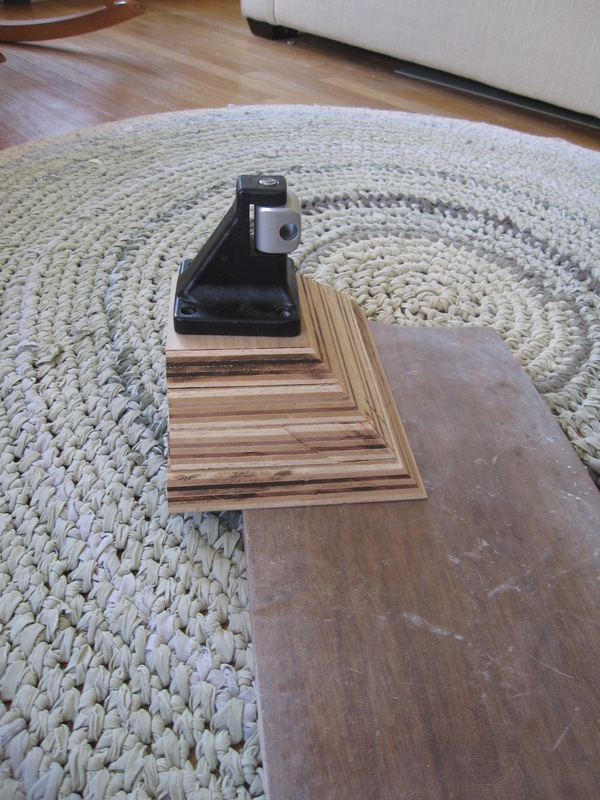 I am making the whole thing in the basement; then I’ll bring it to the boat and screw it in place. 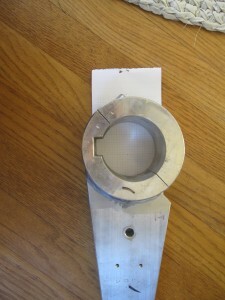 Who am I kidding–the parts have all been back and forth a couple of times already for fitting. Fitting. It is very cold here. Next trip to the boat: bring the top shelf to the boat and leave it there (it’s done); final fitting of cabinet dividers; also, grab a door from the starboard side, so I can match up the finger-pull placement on the new port-side doors in the basement. 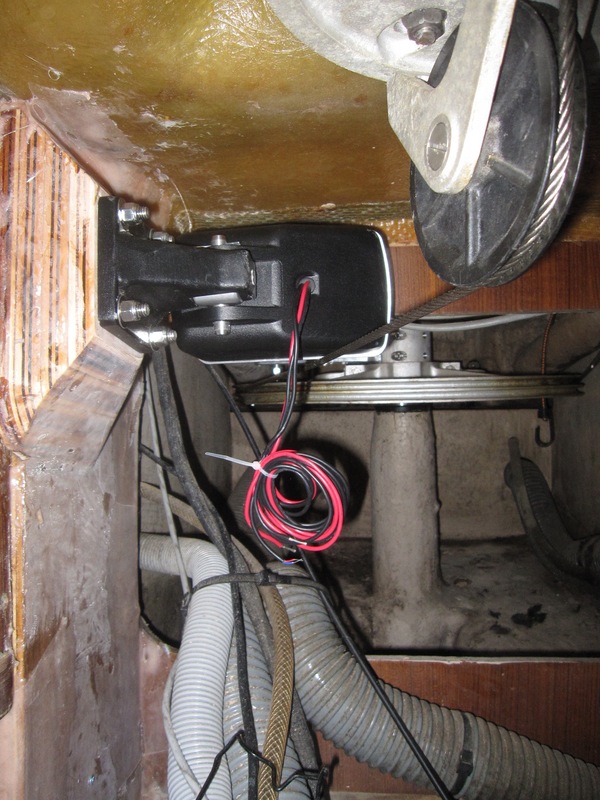 I have friends with a used cruising boat; they too have removed many pounds of wiring that leads to nowhere. 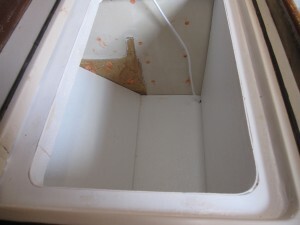 From time to time, I need to get behind my electrical panel to wire in something new (like a new refrigerator or masthead light). 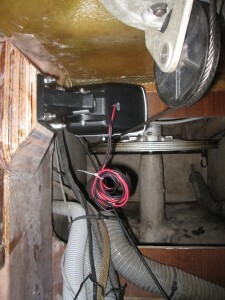 The way things are right now, I have to remove a tricky shelf to give myself access to a 4-inch-wide gap behind the electrical panel, filled with a very confusing rats’ nest of wires. The board under the Book-of-Lists is the new door for the electrical panel. I had one experience where all of the house lights stopped working. After checking switches and batteries, I determined that a wire had come loose. Reaching into the rats’ nest for the offending DC wire, I managed to find and electrocute myself on 110v AC. It sucked. 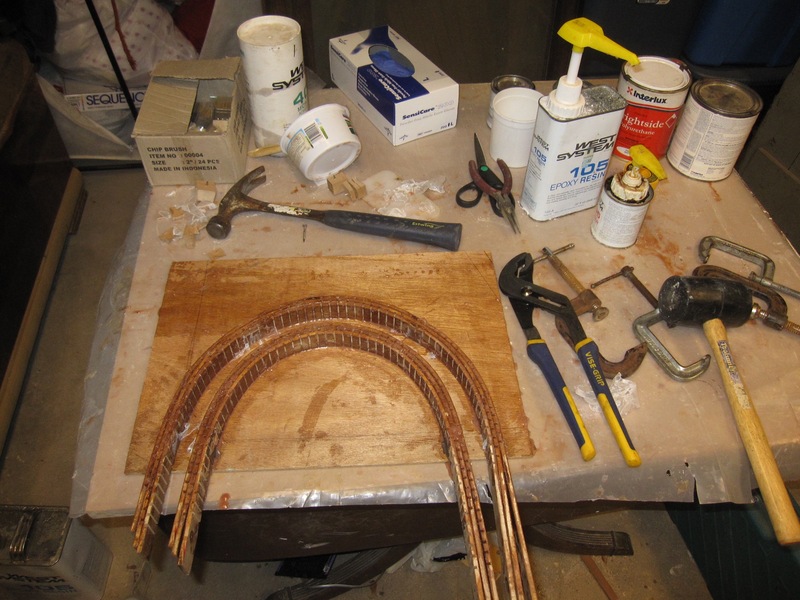 I plan to replace the DC rats’ nest with a new panel. 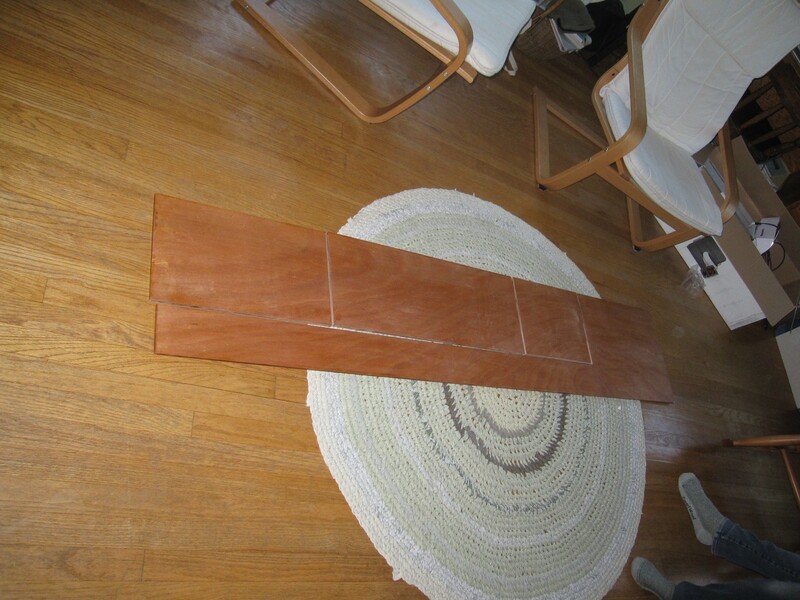 Because there are already holes in the wooden panel, I’m going to make a door to hold the breakers and gauges that hinges open so that I can organize and have easy access to the wiring. 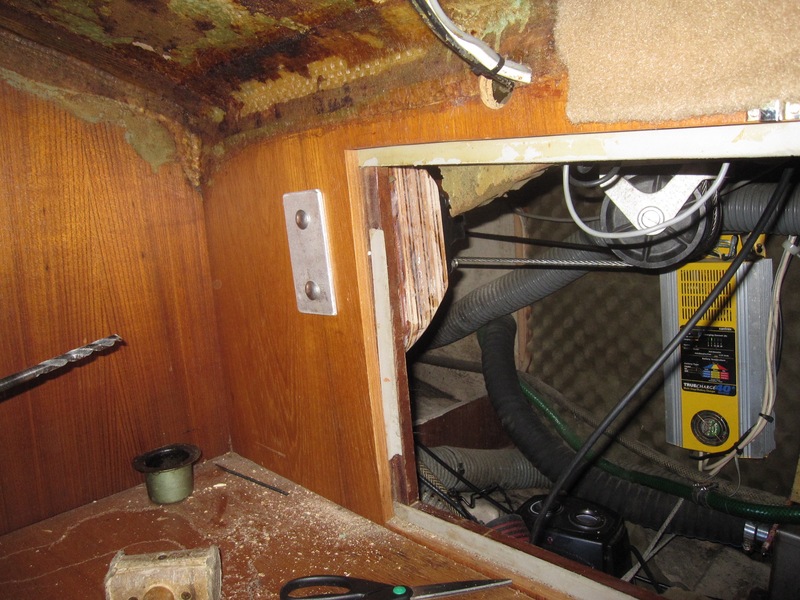 Next trip to the boat: remove AC panel; cut out panel area; fit new door; bring door home to fit panels; and lay out gauges. The refrig project is pretty much on hold. There are still insulating panels for the forward and aft walls of the ice box that need to be fabricated, and I need to finish up the lid. That is all basement work. 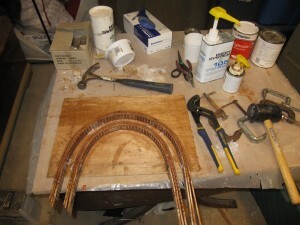 Once I have them done I will need some warmth to glue them in place. 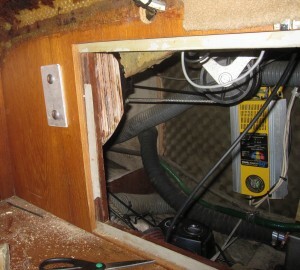 Also there is a big hole in the bottom of the boat, for the new combination galley sink through-hull/keel cooler. 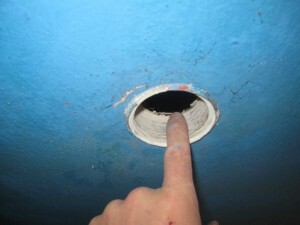 Something should be plugging this hole. Two more sides of the box to cover. Next trip to the boat: nothing for the refrigerator. Hope I can fit the solar charge controller on the wall next to the yellow 40 amp battery charger. Why yes, I did make that very nice aluminum backing plate with square holes for carriage bolts, in order to through bolt to the autopilot ram bracket (going for bombproof). Once the port-side storage is out of the basement, I’ll have room to lay out the panels and get them set up on their mounts. Before then, I need to place the MPPT charge controller somewhere. I’d like to put it in the engine room but I may be out of space after the autopilot stuff is all installed. Next trip to boat: spec placement of Solar charge controller. Currently our navigation is done by iPad. The thing works pretty darn well. Because I am a novice (nervous?) navigator, I also plot on a paper chart at the nav station (even when in sight of the Wisconsin shore). And I have OpenCPN on this here computer, but have yet to use it in real life. The problem with the iPad is that it does not have a home in the cockpit, so it can kind of “bounce” around. I decided that I needed a place to park it. I also need a home for the autopilot control head and the new fish finder/depth sounder display; also, the anchor windlass controls, USB charge port, a 12V outlet (for handheld spotlight), and the new alternator “on” switch. I am building a dashboard, but I am not sure if I like how it fits. Starting to make a box. 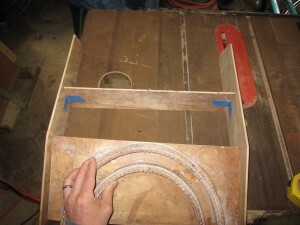 Cold at the table saw. Eyeballing placement. Does it stick up to high? I am going to try and lower the whole box, so it is less obstructive to our sight lines when driving the boat. 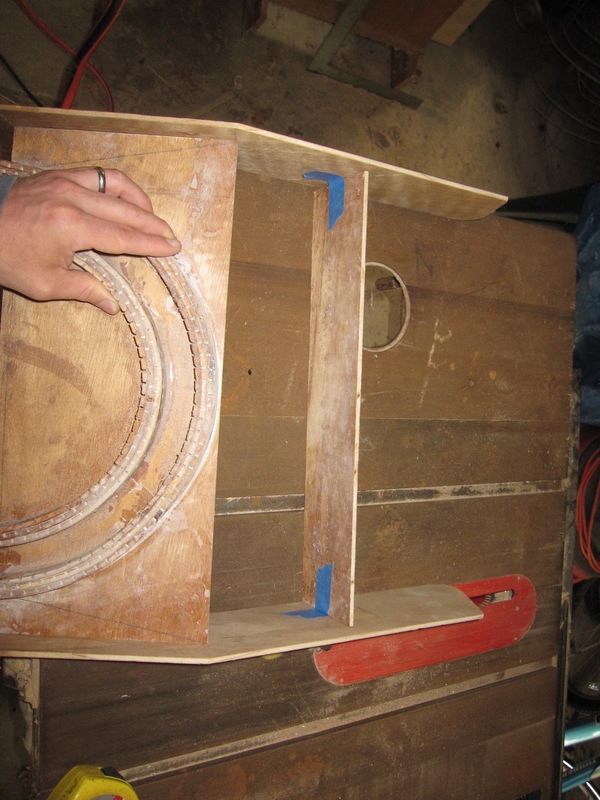 That means I may just cut off and throw away my cool curved wooden bracket. We’ll see. Next trip up to the boat: bring up binnacle compass; see if I can lower instrument pod without interfering with the compass. 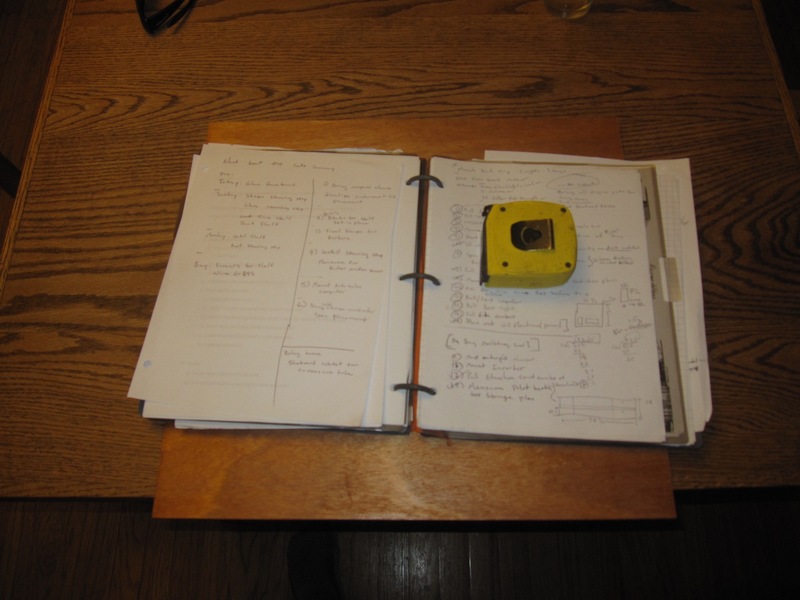 It is probably my training as a nurse, but I like to write and think about the boat in a system-by-system manner (hence, the four part electricity series). The reality is that getting Milou ready is a lot more messy. 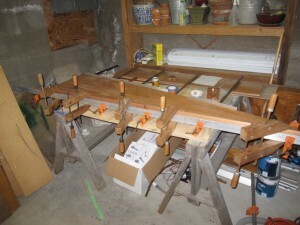 I am constantly juggling at least four or five projects at once, even when it is cold outside. 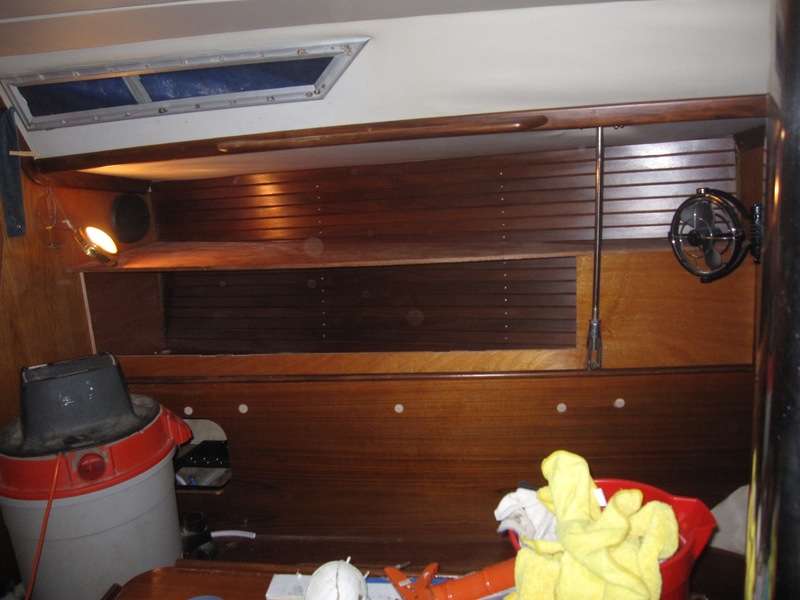 Every now and then I catch myself thinking, “If we put the trip off another year… I could get everything perfectly done…then just give Milou a buff in the spring before we head out.” The reality is, I will never be done, and owning a boat that you do not live on is expensive. Every extra year on shore takes money out of the bank, and keeps us from the goal of getting out there. So: June 12th is the deadline. Milou will be floating, most of the projects will be done. The rest we’ll have to attack while we travel. We’re 100% navigation by iPad–we have back ups, have yet to use them. We have a waterproof mount for the iPad in the cockpit and that has been necessary over and over. On long passages, we leave the iPad down below, but it’s invariably raining or drizzling when we’re approaching shore and need real-time nav info. We used to use a large Ziploc bag, but this is much better. Note: our case blocks the on/off button, but in settings there are accessibility features that allow you to make a button that floats on-screen. All the best. It’s just so easy to navigate with the iPad, it feels like cheating! Like, some day we will pay for our hubris of not doing painstaking position fixes with the sextant (unused, in it’s box). We’ve got a waterproof e-case for it that works great, but we don’t want it to get kicked or stepped on.